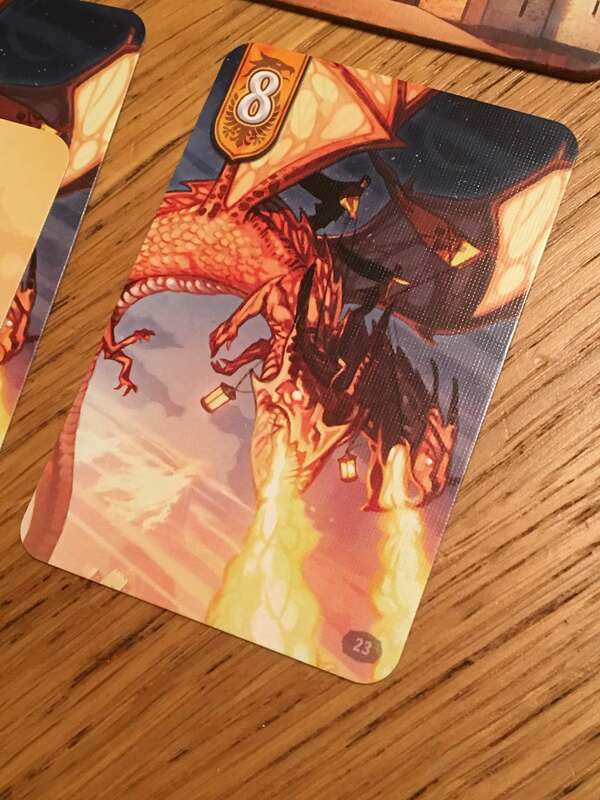 As a crossover video- and tabletop-game site, it’s always interesting for us to see how developers of board and card games take video-game themes and run with them. Where Fantasy Defense is concerned, the target genre is tower defence, with the theme firmly focused on orcs, dragons and other nasties, as well as the human and elf allies who defend the realm against them. Fantasy Defense is a card game with a relatively small footprint. Because of its cooperative nature and speed to set up, tear down and play again, it is also an ideal travel game. The players (or player, as this is just as much a solo game as it is a two-player cooperative) simply lay out a number of gate tiles, then seed a monster deck with various tiers of enemy (from weak, to elite, to boss), then prepare their own deck. Players have access to both human and elvish armies to defend their city. Each of these ‘good’ armies has its own share of special units and abilities, as well as three single-use spells which must be played at exactly the right moment to maximise their benefit. Each turn, enemies spawn at specific gates, depending on information on their cards (for example to the right or left of centre). The player(s) must then play cards from their hand to defeat these enemies (or at least slow them down), otherwise the city itself gets damaged, resulting in a loss of morale. When morale drops to zero, the players lose the game. 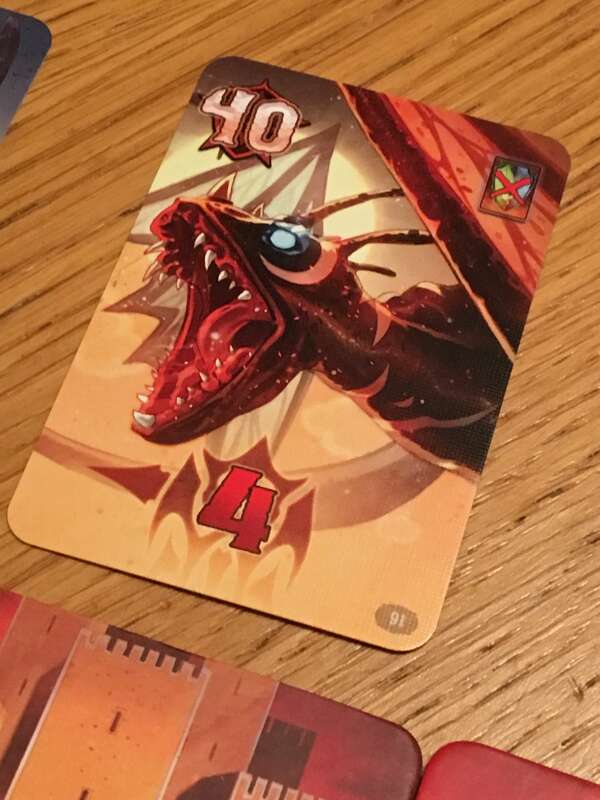 From a hand of five cards, it’s fairly rare to be able to deal with all of the threats to your city walls, so the game tends to demand you strike a balance between accepting some damage, throwing some weak units in front of strong enemies to slow them down and focusing two or three cards onto the same enemy to defeat it where possible. Given that Fantasy Defense is basically a card game in a very small box, it looks nonetheless impressive when laid out on the table. The tiles that represent the city don’t do much except create the gaming space, but they are made to a very high standard and most importantly, they fit together in a visually pleasing way. Much more impressive, however, are the cards that make up the actual orc, elf and human decks. 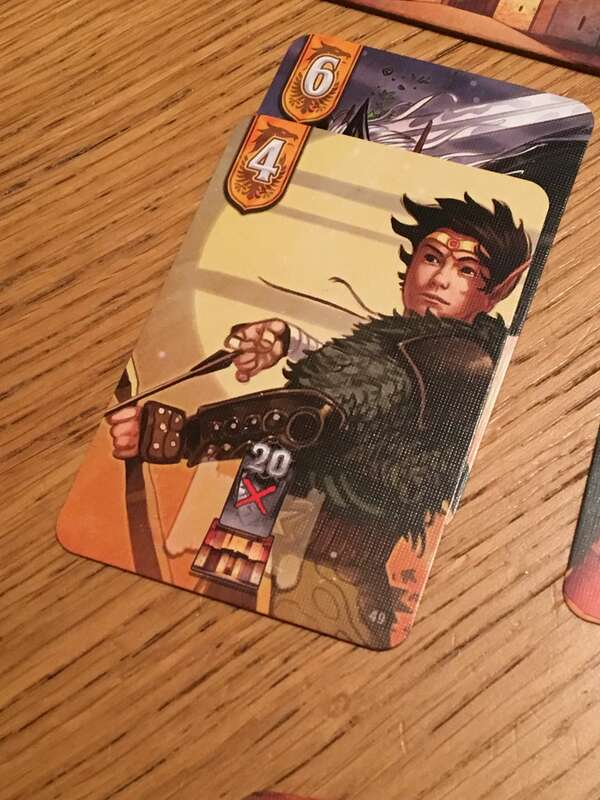 The artwork in Fantasy Defense is among the finest I’ve seen, with gorgeous, full-art pictures of goblins, orcs and terrifying dragons, as well as brave human leaders, elvish sorceresses and much, much more. There is a decent mix of characters among the two hero decks and whilst the enemies do have a good deal of variety, there is some repetition among the lower-ranking foes. Elite enemies and bosses are more individual and the fact that not all enemies will feature in every game certainly increases the chance to replay it. 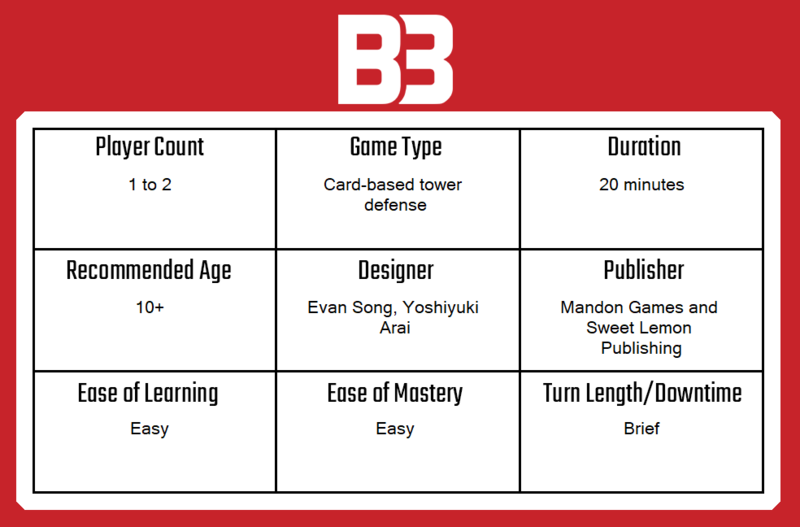 Turns in Fantasy Defense follow a very simple structure, with four basic phases in each turn. Those phases include the Invasion phase, which involves drawing three cards from the invaders deck and placing them, one by one, face up in front of gates from the left or rightmost side of the board, depending on the arrow shown on them. Once every gate has an invader on it, there’s no need to play further cards — you’ll have enough trouble on your hands! Next, players respond to the invasion threat by playing cards from their hand in the Strategy phase. You can place as many cards as you wish (up to your whole hand) but each card must be placed on a specific gate. Defenders already in play can move along one gate in either direction, but no further. As defenders enter the battle, they may bring with them specific benefits that either happen immediately or last indefinitely, so it’s important to consider these effects during deployment. After the Invasion and Strategy phases are complete, players do battle with the invading hordes — a simple mathematical exercise that is more or less determined in advance, because a sensible tactic is to place human and elf army cards in advantageous ways to force the outcome you want. For each gate where the value on combined player cards is higher than that of the invader, the invader is killed, whilst at each other gate where the invaders have a higher value (or are unopposed), the defenders are all killed and the city loses morale. If you ‘burn’ a defender by placing it in front of an invader to die, the effect on city morale is halved (rounded up) whereas if the attack is unopposed, the city takes full damage. Finally, for each successful defence, you must sacrifice one of the defenders in combat due to attrition. The players then draw five new cards from their decks, but since it’s always acceptable to hold back two cards, it’s worth noting that you always draw five (so the maximum you might hold after this step is seven) rather than drawing up to five. This cycle repeats until all invaders are dead or the city morale falls to zero or less. Ultimately, whilst fun, Fantasy Defense feels gratuitously difficult to me! It took me an absolute age to actually win a solo game and unfortunately, I felt that when I did, luck played a large part in it thanks to the way that cards were drawn. On the flip side, since there’s no dice rolling here and you’ll always see the vast majority of cards eventually (only a few invasion cards and bosses are excluded) I am not sure I can substantiate that claim, really. Regardless, I almost always enjoyed playing the game, especially solo, which is where it becomes a really mind-bending puzzle. From the very outset, the game gives off the impression that the player(s) are in real trouble and, as invaders flood the beleaguered city, defending it becomes ever more challenging and desperate. As you move into the Strategy phase, you’ll feel the pain of having to determine which enemies to focus on defeating, whilst sometimes you’ll be forced to sacrifice a good card on a lost cause, just to stem the tide. Cooperative mode has a few subtle changes, such as the number of enemies you face, but it also makes the game feel much easier. It changes it in such a way that I’d even recommend learning to play solo by using both decks as if you were playing cooperatively, as it just softens the edge of losing several games consecutively whilst you learn the most efficient way to play. 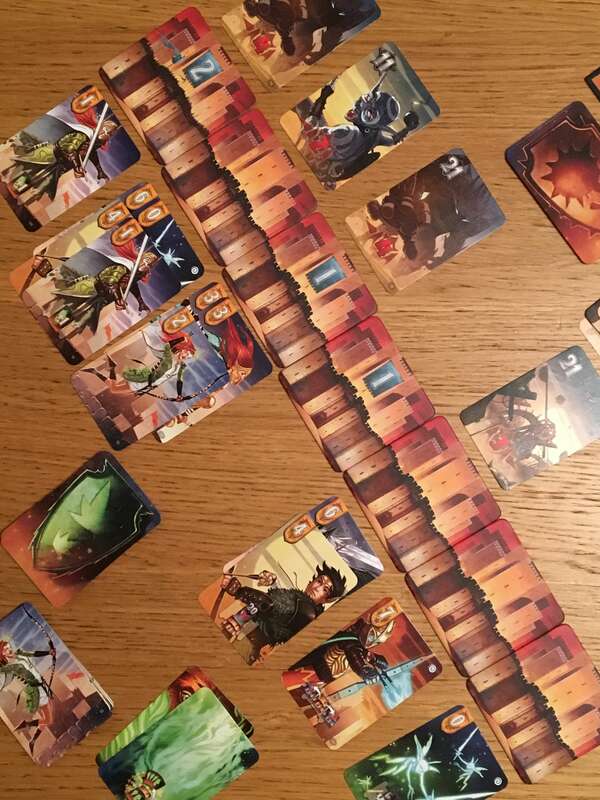 I should also mention that my version of the game came bundled with The Stone King expansion, which adds an episodic story with five or six new cards each time you finish the last ‘level’. Sometimes these cards are new, unique enemies, whilst on other occasions they are allies or spells. In any case, without revealing any spoilers, this expansion does add a lot of variance to the game, as well as a compelling reason to forge on through multiple games. On the downside, it doesn’t really fit in the base game box until you’ve ‘completed’ all the chapters, which is a shame. Ultimately, given the price point and small-form factor, it’s impossible to feel less than satisfied with what Fantasy Defense has to offer. It’s a gorgeous game with lots of replay value for the solo or cooperative pair and it is fairly challenging, too. There are ways to make cooperative mode harder, so it’s not as if my only real complaint about the game (effectively, balance of difficulty) can’t be addressed quite easily. All in all, it’s well worth looking out for Fantasy Defense in your local game store, especially if solo and cooperative games, or tower defence, is your thing. A copy of Fantasy Defense was provided for review purposes. You can find out more about Fantasy Defense on the website of publisher Nice Game Shop.